← The Training Begins in Earnest! Yeah, babe – it’s cold outside! After a couple of years of relatively mild temperatures, winter seems to have made a comeback in Ottawa. Over the course of the last few weeks, we have had temperatures in the negative double digits and a bitter wind has added the dreaded wind chill factor and makes it feel even chillier. Acquaintances and colleagues often ask me if I run in the winter. When I answer in the affirmative, they probe with talk of treadmills and indoor tracks. Upon hearing that I run outside all year round their eyes go wide. 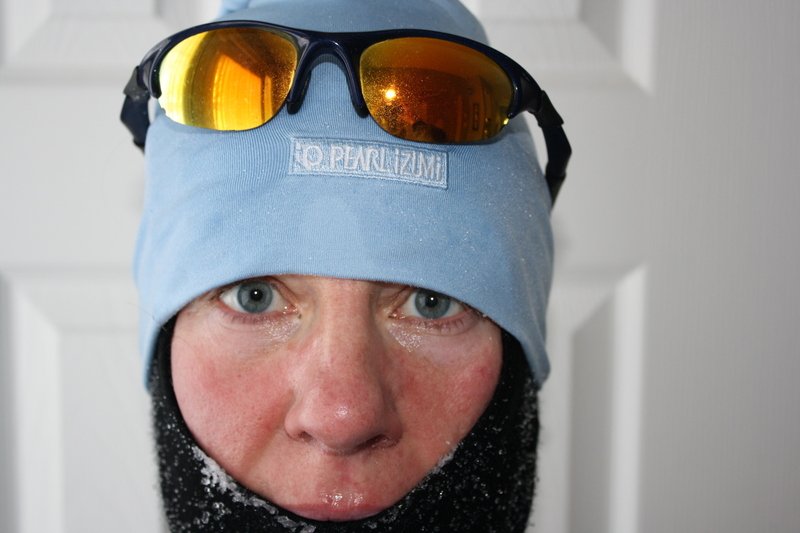 I already have a reputation of being somewhat strange, since I run races that are 100 km long (“Really – over how many days?” they will ask), and running outside in minus 24 degrees Celsius just adds to this perception. But as anyone who runs will know: there is no bad weather, there is only bad gear. If we took the Goldilocks approach training, we’d never really get in shape, as it would likely always be too hot, too cold, too rainy, too windy and rarely just right. So we just get out there and enjoy whatever Mother Nature will throw at us. Canadians know that dressing in layers is the key to staying warm in winter. Wicking layers close to the skin will transport any moisture away from the body. Then we add a thermo layer to keep warm and finally a shell to keep the wind out. Exposed skin can freeze pretty quickly, so I cover up. The bits that are unprotected even when sporting the bank robber look, I cover with Vaseline to prevent frostbite. Beware of overdressing, though, as we can go from overheating and sweating excessively to hypothermia very quickly. Footing can also present a challenge when winter running. After a fresh snowfall, running on bike trails and sidewalks will be slow going and hard work. I don’t worry about distances and pace in those conditions and tell myself that if it’s hard, it’ll make me stronger. After all, that’s the reason for being out there in the first place. Ice is a different story, though, and taking the risk of getting injured in a fall is just not worth it. 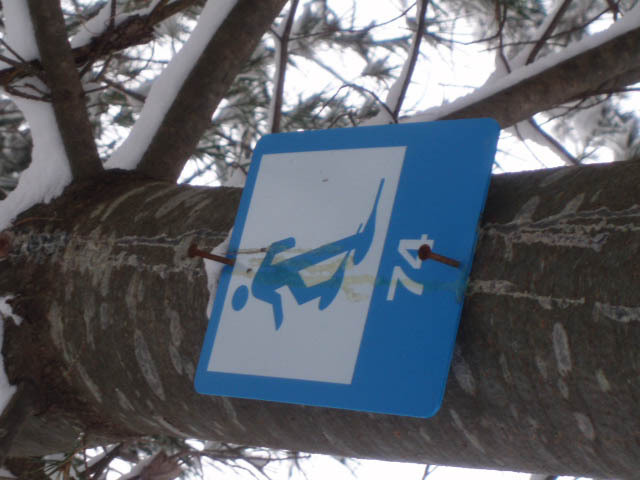 If it’s really slippery, I strap a pair of running snowshoes to my sneakers and hit the trails. Snowshoe running is a phenomenal workout and opens up a whole lot of trails that may not be accessible just in sneakers this time of the year. Here in Ottawa, we can also take to the ice! Skating on the Rideau Canal is another cross training option which especially appeals during the Winterlude Festival where hot chocolate awaits at the many vendor stalls on the Canal post workout. The benefits of chocolate milk as a recovery drink have been well documented in sports nutrition literature of late. Anyone skating on the Canal will also spot runners who use the edges of the Canal as their running route. Old school Canal runners will often put screws into the soles of their sneakers while the more modern athlete may just pick up a pair of YakTrax to save themselves the trouble. Cross country skiing is also a perfect alternative when the footing is bad on the roads and sidewalks. And as with any cross training activity, it works some muscles that we underutilize in running and thus helps build better overall strength. But there is one more important ingredient needed for training on extra cold winter days – a positive attitude! Winter in Canada is long and few of us have the option to jet off to warmer climes for half the year. So, embrace it, make it your friend, enjoy the beautiful winter scenery and most importantly, just get out there! This entry was posted in Winter Running and tagged cross country skiing, cross training, Rideau Canal, Rideau Canal Skateway, Skating, winter running, Winterlude, x-country skiing. Bookmark the permalink. 4 Responses to Yeah, babe – it’s cold outside! Great post Andrea! Suitable for an Outdoor Magazine article. Thanks, Gail! Marc is just getting out skis ready to get out there now. We are heading up to P17. Maybe we’ll see you on the trails! Yummy! We came home to unspiked lattés, which is not bad either!